Ahavat Olam’s Tu be-Shvat seder last week raised funds for about twenty olive tree saplings to be planted by Rabbis for Human Rights in Israel to replace some of the tens of thousands of life-giving olive trees destroyed by Israeli settlers, military and civil authorities throughout Palestine. The planting has begun. 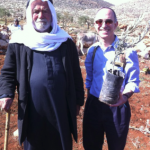 See http://t.co/DaT2ZRV for a lovely video in the village of Magheir and a report from Rabbis for Human Rights at http://www.rhr.org.il/index.php?language=en.